Rockwell introduced their all-new BladeRunner in January, 2011. This power tool is a multi-function saw capable of making miter cuts, rip cuts, inside cuts and scroll cuts. Utilizing T-shank blades, this saw is able to cut through a variety of materials including wood, metal, PVC, vinyl and ceramic. The BladeRunner is surprisingly lightweight making it easy to carry. Overall, we were pleased with the BladeRunner performance, and would recommend this tool. 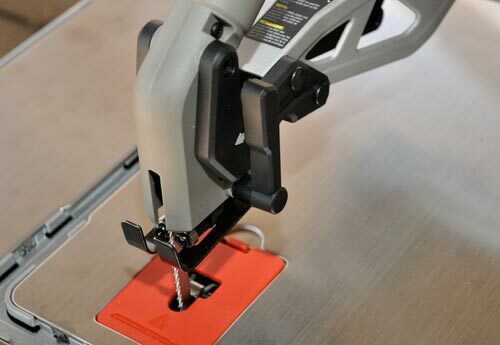 It’s a great addition to your workshop and a should be considered in lieu of a scroll saw or band saw. 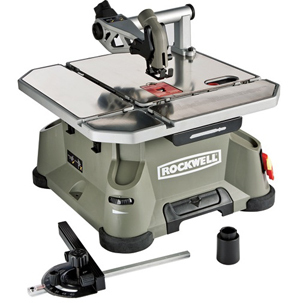 Rockwell Tools is a brand known for making quality products on par with professional names like Bosch. They bring some really innovative tools to market like the Sonicrafter Multi-Tool and the JawStand. We were very interested when they offered up the chance to review the BladeRunner. The Good: Capable of making several different cuts; cuts multiple materials; variable speed; lightweight; accepts all T-shank blades. The Bad: Short, 4′ power cord; won’t replace miter or table saw–meaning you’ll still need them. 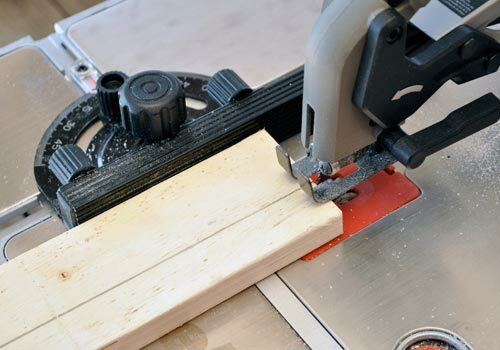 Overall: This saw is a good alternative to a scroll saw or band saw and is great for precision cutting. Since it accepts all T-shank blades, you don’t need to purchase a new proprietary blade. It’s a welcome addition to our shop. The BladeRunner is capable of making miter cuts, rip cuts, scroll cuts and inside cuts. 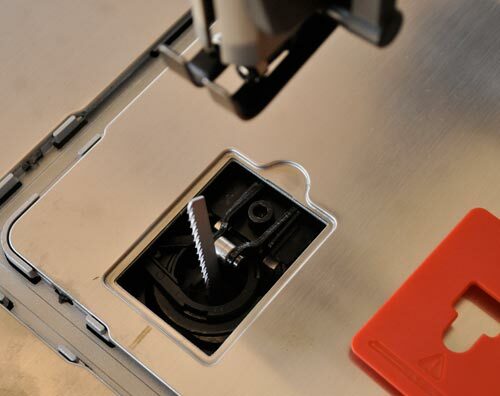 We tested it on wood and ceramic, but it can also cut PVC, aluminum and mild steel. Rockwell includes 5 different T-shank blades and it’s important to select the right blade depending on material. 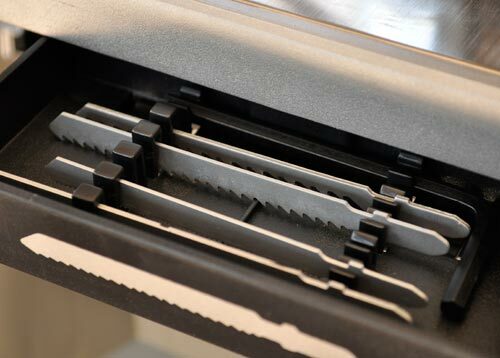 Using high-quality blades will also ensure better cutting performance. The 5.5 amp motor is comparable to a jig saw and worked well for every cut we made. It adjusts between 800 and 2,800 strokes per minute (no load) with a 7/8″ stroke length. The variable speed allows you to ser the power depending on material and application for better control. Vibrations are minimal. Even so, we suggest moving the arm snug over the work piece and using the lock-down lever on the right side of the arm. The miter gauge doubles as a rip fence, and can be placed in the slots found in the deck. 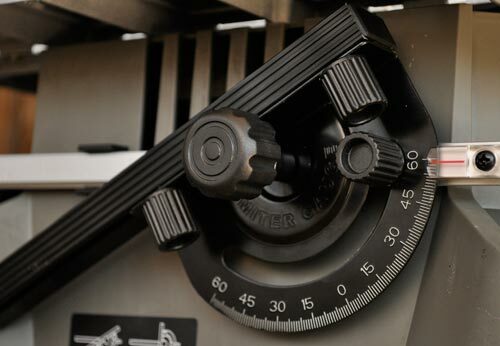 The miter gauge adjusts between +/- 0 to 60°. The fence can be adjusted left and right, and a large knob allows you to lock it in place. Rockwell wanted to maintain portability, and so the fence is very short. It’s made of plastic, and, while we would appreciate something more durable, found it adequate. Ultimately, the fence has its uses but cutting free-hand is easier. 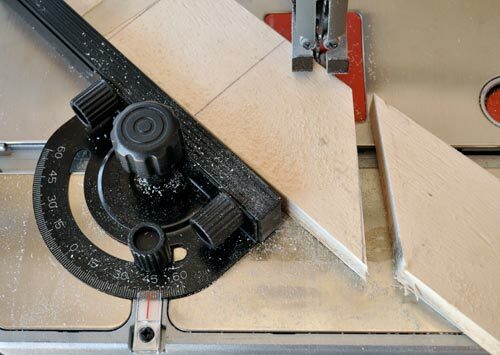 To make miter cuts, Rockwell suggests setting up the miter gauge and using it to push your material through the blade. For rip cuts, lock the fence in place. There’s no push stick so you’ll have to find a substitute. Inside cuts are also very straight-forward. Temporarily move the arm out of the way to position the work piece. Always move the arm back over the blade before starting. In addition to these cutting capacities, it’s important to know that the arm attaches to the deck on the back, right. It never proved to be an obstruction, but could be problematic for cutting medium sized sheet products. 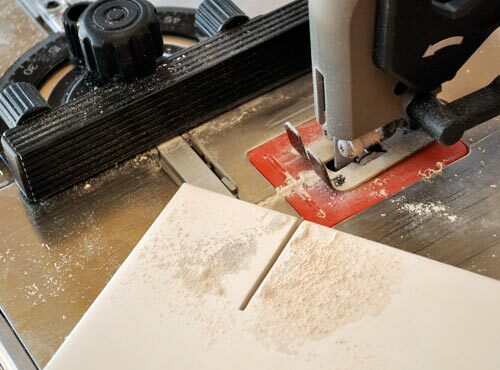 The Rockwell site states that you can “go from cutting ceramic tile for your bathroom to cutting wood to finish making your own birdhouse” in only 3 seconds. It’s not often that we find ourselves in that sort of situation, but we were impressed with how easy it is to change blades. To release the blade, you push the recessed button and slide it to the right. Swap out the blade and you’re done! They include a little red cap for additional protection and handling hot blades. Keep track of it because it’s easily lost. 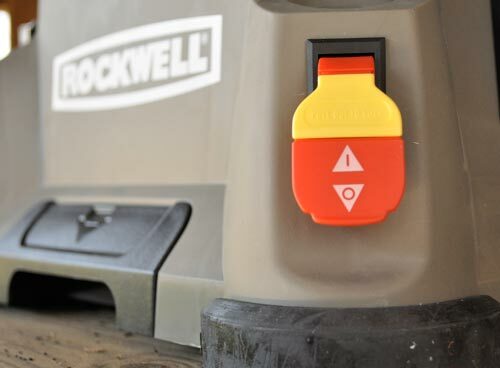 We’ve said it before but we really appreciate that Rockwell choose to utilize T-shank blades. Most users will already have a set at hand and they are easy to replace. There’s no concern to track down a specific, expensive, proprietary blade. The BladeRunner features solid construction. Four rubber feet provide stability and help reduce vibrations. The body and drawers are plastic and the table is brushed stainless steel. This makes it very durable and easy to slide materials. The attached arm is a metal. The top measures 17″ x 15 3/4″. We would have appreciated a larger top, but again, Rockwell made sacrifices to maintain portability. If you examine the body, you’ll notice a couple nice features. There’s a handy blade storage drawer front and center, and a dust collection drawer at the base. The left side has a bracket for storing the miter gauge/rip fence. The backside has a windup for the power cord, and the right side has a convenient handle. We were very pleased with how easy it is to carry the BladeRunner. This unit weighs a surprisingly light 17.6 lbs. It’s comfortable and balanced, and you’ll have no problem moving it around. Rockwell included a wall mount, screws and drywall anchors with every unit. To mount it, slide the BladeRunner onto the brackets, and turn two safety latches to lock it in place. We didn’t test the wall mount, but we like the idea of saving space on your workbench. 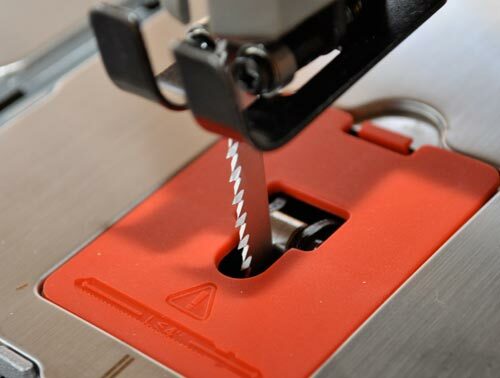 Similar to a table saw, the power switch has a safety insert to prevent it from being turned on. The adjustable arm also serves as a vacuum dust port. You can attach it to any shop-vac with an 1-1/2″ connection. Rockwell offers a couple accessories for the BladeRunner including a circle cutter and a picture frame cutter. The circle cutter (RW9261, $29.99) can create perfect circles up to 18″ in diameter. The picture frame cutter (RW9262, $29.99) helps setup your corners and can cut frames up to 26″. We didn’t test out these accessories and neither seems like a must-have. If you’re in the market for a new scroll saw or band saw, look into the BladeRunner. The big advantage it brings is being able to make precise cuts, even inside cuts, on a variety of materials, and you don’t have to purchase expensive, proprietary blades. Currently, these units cost $180 but prices typically drop about 6 months after release. You can buy the blade runner at Amazon, Home Depot, and other home improvement stores. This is the best Bladerunner review I have seen! Good job Ethan! I purchased RK7321. (RK7321 on the box) Inside the box was RK7320. Is RK7321 a Improvement over RK7320? the t blade only seats it self from side to side. the blade should sit front to back the way it should be for cutting. What can I do to a just the blade holder to be front to back. Not side to side. I await your help thank you. Killer review. I wonder if you could start making some creative, or decorative, sheet metal stuff with that thing? i just put some in my house, on my fence, and it looks stellar. Thanks again! I bought a Rockwell BladeRunner Rk7320 aabout three years ago. Somewhere down the way the top part has become lost (the arm and apparatas that holds the blade). Can I get these parts replaced? I have been using this tool from one year. Rockwell bladerunner is an amazing tool. It cuts very nicely, just love this tool. It’s a great post for DIY lover. I love DIY works but never use big blade runner. I love rockwell brand, it’s a great brand in USA. I have a rockwell reciprocating saw that perform great. Extremely helpful article. Thanks for sharing! Great article, and thanks for taking the time to publish it; really opened my eyes for some new perspectives that I hadn’t thought of before. Great reviews…! You have shared an informative information about BladeRunner. Really Rockwell is the very good brands. I am full of inspired now to using this BladeRunner. Thanks for sharing your post. Rockwell tools one of the best tools company. I use Rockwell Bladerunner since 2007. its one of best tools I ever use in my life.